The INVENTOR is an educational family game that will be interesting for both kids and adults. 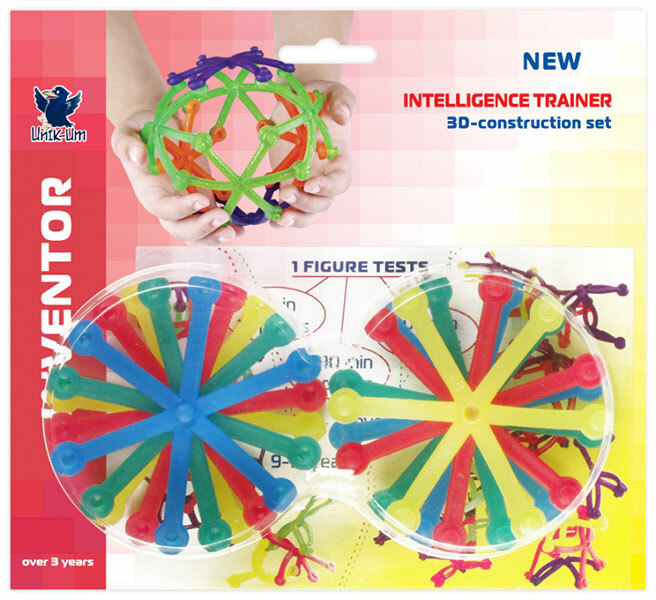 The universal 3D-construction set is made of soft, flexible elements that stimulate intellectual development. It gives adults the rare chance of showing their children a fine example of creativity. The construction set allows you to create figures of animals, abstract figures and anything else that you can imagine. Each new added element increases the number of possible combinations and figures. A child not only gets pleasure playing with mom and dad but also learns to create and acquires useful skills that will help him to succeed in school. The set includes four fascinating tests that help to measure the level of intellectual development and creative imagination of children aged 3-5, 6-8, 9-12 and over 13. Recommended for children over 3 years old, teenagers and adults.